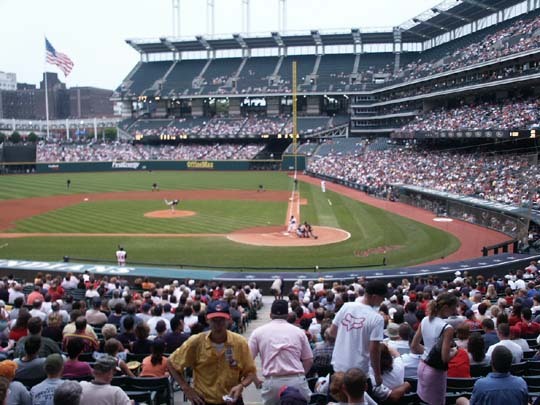 The Cleveland Indians play at Jacobs Field. 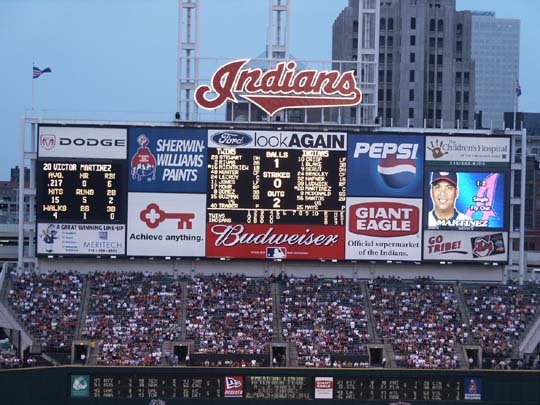 This stadium was built in 1993 seating 43,345. 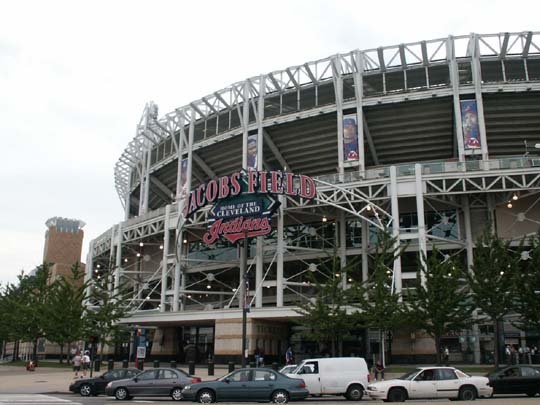 The stadium is named after the Jacobs family who bought the Indians in 1986. 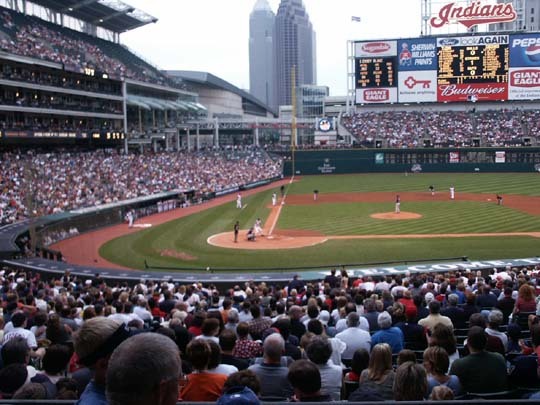 This is the 103rd year that Cleveland has been a member of the American League. 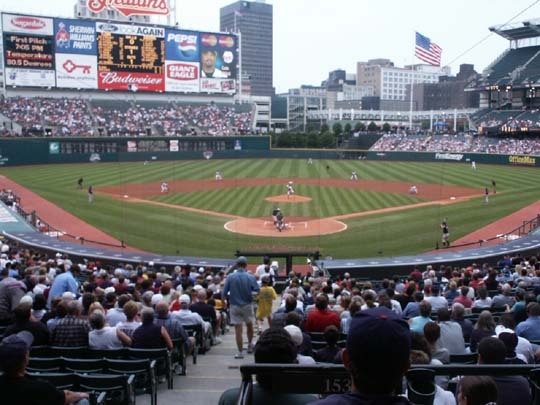 This is a really nice ballpark. 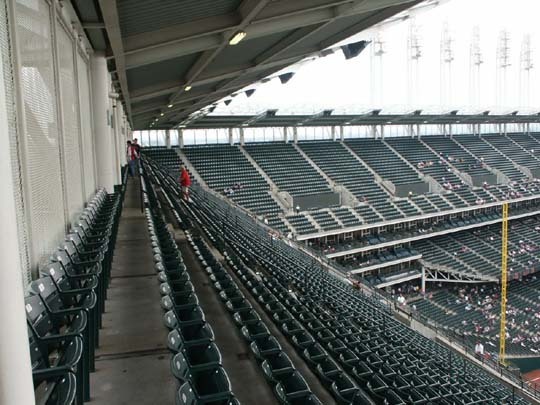 There is no second level seating as there are three levels of suites. 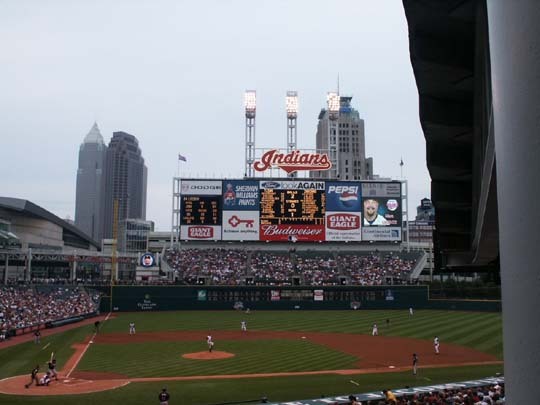 Sitting on the first base side you have an excellent view of the scoreboard and video board. Even with a stiff wind blowing we really didn't feel it where we were sitting on the 3rd level between home and 1st base. 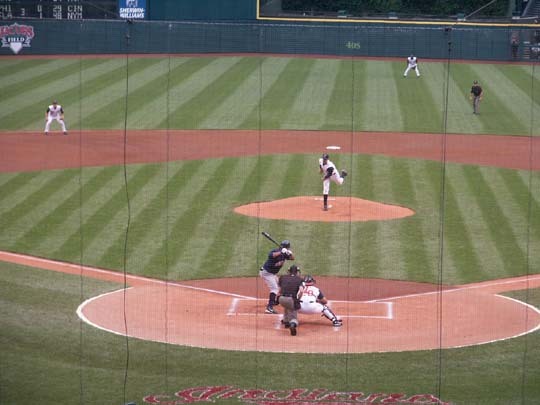 The Indians were playing the Minnesota Twins and were successful winning 9-2. 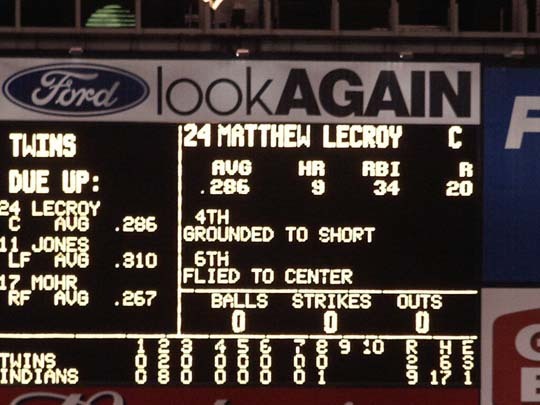 The box score was Twins R-2, H-6, E-3 and Indians R-9, H-17, E-1. The field lines are RF-325', RC-375', CF-405', LC-370', and LF-325'. There is a varied selection of good food items and the items are offered on both the first and third level. 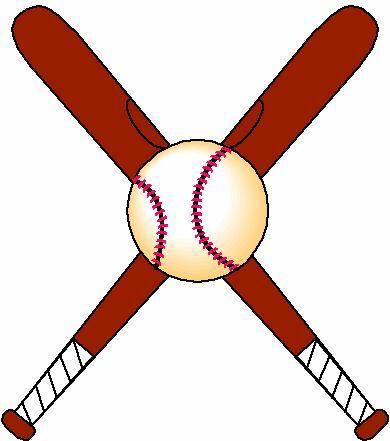 There are lots of picnic tables outside the 3rd level seating areas where you can eat before the game starts. 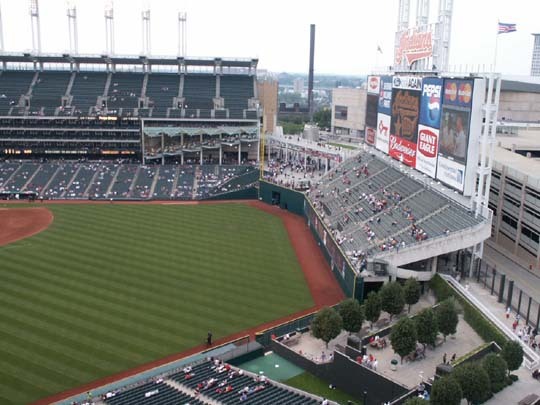 There is a section with trees and picnic tables on the 1st level beyond the centerfield fence where you can enjoy your food before the game. 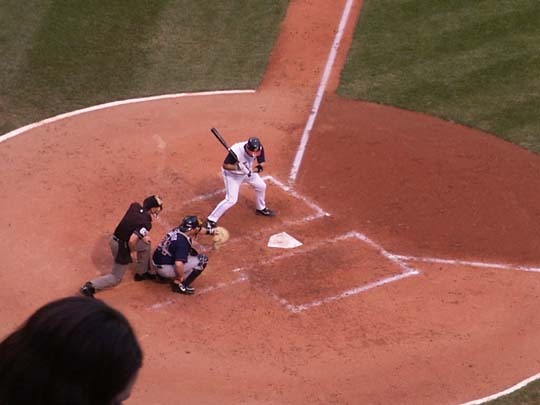 It is closed during the game as it is in the batter's view. 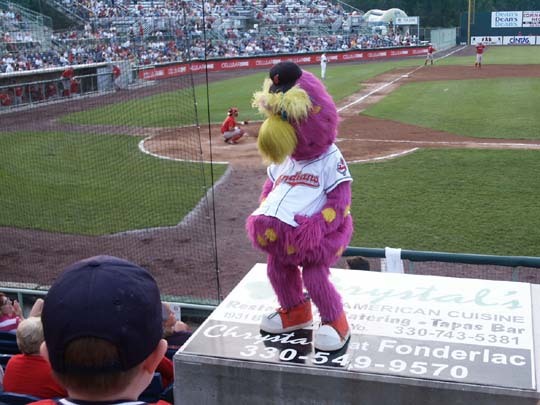 The mascot is Slider. 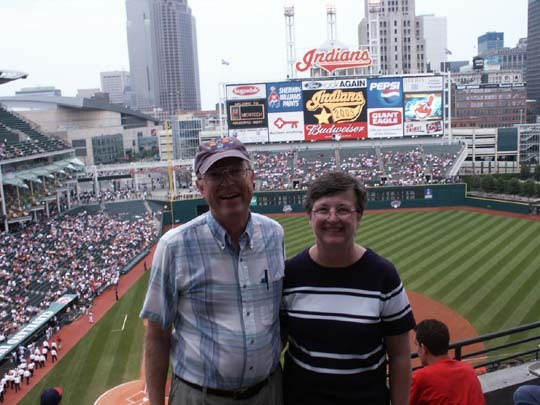 I took his picture when he visited the Akron Aeros, a Cleveland affiliate. 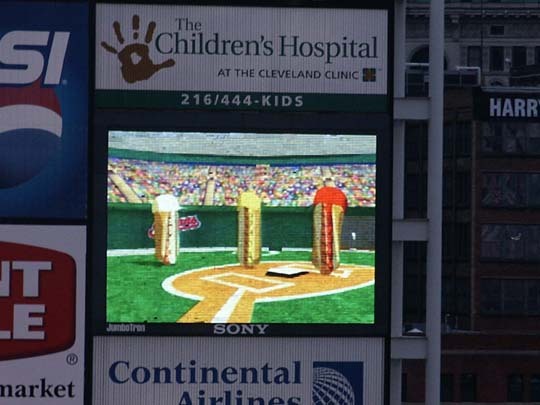 A between inning video activity was a computerized hot dog race with three hot dogs-one had catsup, one had mustard, and one had onions. Today the one with onions won the race. 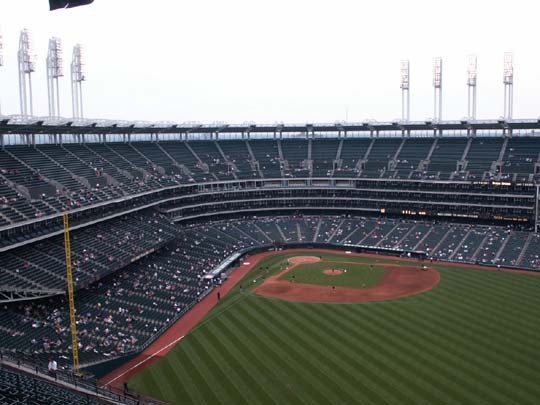 Attendance was only 25,077, not many fans in the upper level especially at the ends of both baselines. 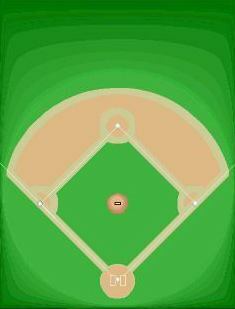 2014 called Progressive Field and new logo. Rock and Roll Hall of Fame and Museum is dedicated to the living legacy of music from Delta blues to rock 'n' roll and to the continuing evolution of music today. Fee.